The basalt-topped Mount Yengo dominates the sandstone landscape. Yengo occupies the quiet corner of the Greater Blue Mountains World Heritage Area, a place of subdued landscape and few visitors, a park that reveals its subtle qualities to those who delve a little deeper. For many years, it remained an expanse of vacant Crown land, largely unknown, well off the beaten track and overshadowed by the quest to protect the more dramatic landscapes further south. 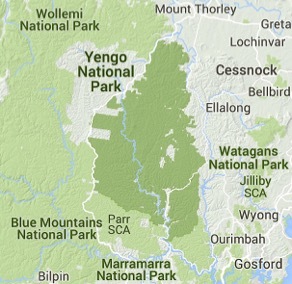 Yengo was one of the last national parks of the World Heritage Area to be declared. It did not come until 1988, in the 200th year of the colony of New South Wales, and now amounts to an area of 153,000 hectares. Most recently, in 2009, much of the park was declared as a 119,000 hectare wilderness, in recognition of its largely intact natural condition. Both declarations only came after many years of lobbying by conservationists and the gradual whittling away of bureaucratic hurdles. From the air, Yengo appears as a repetitive maze of small creeks and lumpy ridges – except for the twisting line of the Macdonald River carving a deeper trench of sand from north to south. Looking in from the side, from Finchley Trig perhaps, the remarkably even height of the Hawkesbury Sandstone ridge-tops is punctuated only by the abrupt thrust of Mount Yengo and Mount Wareng (Little Yengo), both flat-topped remnants of 17 million year old basalt lava that flooded across the land. To most modern Australians, this is an unremarkable landscape. But to the first Australians it was a bountiful land. The park is rich in rock art, occupation sites, story places and other features of Darkinjung, the Dharug and the Wanarua Country. Mount Yengo, rising 300 metres above the dissected plateau, stands out for a great distance in all directions, and is deeply significant to Aboriginal people over a much greater area of south-east Australia. The mountain’s flat top is where the creation being Biaimie is said to have stepped off into the sky after making the world. 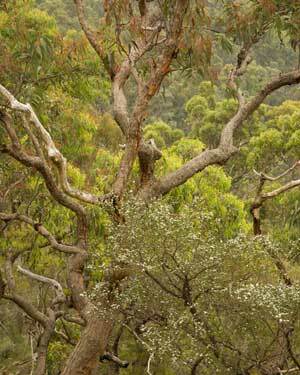 As a mainly wilderness park with very rugged terrain, Yengo has limited visitor facilities. 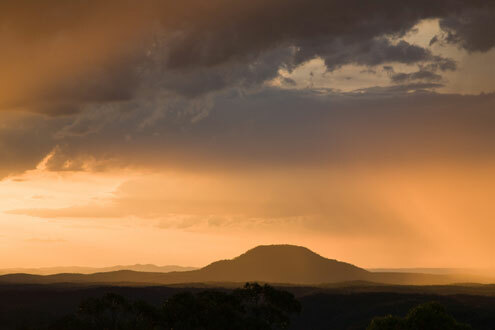 At Finchley Trig, you can enjoy an expansive view across this vast bushland, with Yengo prominent, and all the way across both Yengo and Wollemi national parks to the high basalt peaks of the Great Dividing Range arrayed along the western horizon. Nearby, at Finchley Aboriginal Area, you can explore a gallery of figures engraved into a large rock platform. These places, and an adjacent camping area, can be reached by a rough gravel road for which a 4WD vehicle is desirable. More accessible, and right beside the Wollombi Road, is the Mogo Creek Camping Area, several walking tracks, and part of the Old Great North Road. This convict-built structure was the first road to link Sydney to the Hunter Valley. It traverses part of Yengo National Park and the adjacent Dharug National Park, and was listed as World Heritage in 2010 as one of a suite of Australian convict sites. The Old Great North Road can be cycled or walked over two days. The former grazing property of Big Yango, at the foot of Mount Yengo, was purchased and added to the national park in 2000. Here, cleared grassy valleys wind through the bush and visitors can choose from several accommodation options, from the homestead to camping sites. Yengo’s beauty yields most to those who take the time to stay and explore. The climate is somewhat drier than both the higher ranges further west and the coastal zone to the east. Ridge-top woodlands of Yellow Bloodwood and Baker’s Angophora come to life with flowering shrubs in spring, while the gullies and creeks are coloured by sandstone caves, soaring Sydney Blue Gums and patches of rainforest. Together with Parr State Conservation Area which adjoins to the south, Yengo protects 43 different eucalypt species and numerous rare and threatened plants and animals. Important threatened fauna include Brush-tailed Rock-wallabies and Regent Honeyeaters. A canopy that lets a lot of sunlight through is characteristic of Australia’s eucalypt forests, distinguishing them from many other forests around the world. These curly trees are Baker’s Apples (Angophora bakerii), a common species in the drier parts of the northern Greater Blue Mountains. Stormclouds brew over Mount Yengo, where the great spirit Baiame is said to have stepped off into the sky. 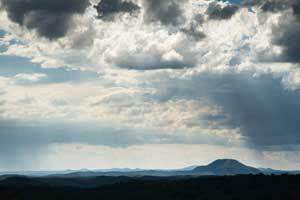 Arrayed on the horizon are the many basalt peaks of northern Wollemi National Park. 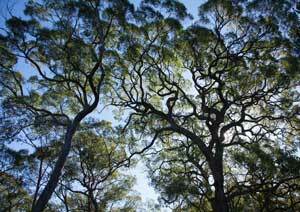 Yellow Bloodwood (Corymbia eximia) is another common tree of Hawkesbury Sandstone country at lower elevations. Dull grey leaves contrast with the yellow bark, and most summers they erupt in a blaze of gum blossom that fills the air with honey aromas and feed a myriad birds.